Originally a CAMS-operator for Swiss TV, Feurer's artistic eye led to his fascination with glass. In 1980, he began his career in art glass by creating artistic stained-glass windows. In the early 1990's, he advanced his education in glass by attending fusing seminars with various artists, including Giles Bettison, Matthew Curtis, Linda Ethier and Rudi Gritsch. 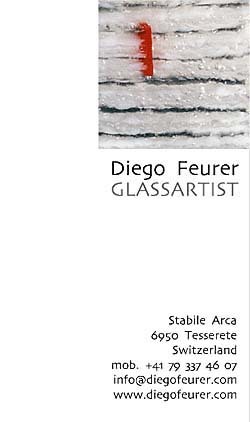 He began another collaboration creating artistic glass windows with Fra Roberto, an important Swiss artist, in the 1980s which continues today. Feurer received a major commission in 1999 from the Swiss Office of Construction and Logistics to create a glass fused ceiling for a multipurpose hall. (each 61cm x 122cm) and weighs 3 tons. It was also in the 1990's that Feurer started to blow glass, attending various workshops with such renowned artists as Giles Bettison. In addition to his own work, he assists other artists in the realization of their works of art. In his latest work, Feurer developed an entirely original form of murrine, the glass mosaic. This process allows him to fade his colors, giving a more painterly effect to his work, which was not previously possible with normal murrine techniques. "The Jorgen Schou- Christensen Prize"